Join our exploration of marine life of the Gulf of California at the Marine Discovery Lab at the University of Arizona. Read more about the Marine Discovery Lab field trip. 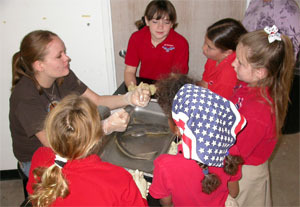 Students are led through the dissection of a dogfish (Squalus), with an emphasis on body form and function, and adaptations to the marine environment. How has the shark adapted to its environment? Where is the shark found? What does it eat? How does it swim? What is its prey? What preys on it? How does it reproduce? What is the external and internal anatomy of a shark? How are sharks similar to and different from bony fish? Why are Spiny Dogfish caught by humans? What are some of the impacts of over fishing? How big was the fossil shark Megalodon, based on the size of its teeth? 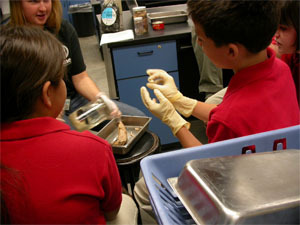 Students dissect a squid (Loligo spp. ), and focus on its special adaptations. How has the squid adapted to its environment? Where is it found? What does it eat? How does it swim? What is its prey? What preys on it? What is the external and internal anatomy of the squid? Why are squid caught by humans? Students compare the body forms of a variety of preserved fish to determine where they might live, what they eat, how they protect or camouflage themselves, and how they move. Form and function are explored in detail through this hands-on activity. Where are these fish found? What do they eat? How do they swim? What are their prey? What preys on them? How do they protect themselves? How has each fish adapted to its environment? What does the shape of a fish tell us about what it does for a living (form and function)? Students are led through a discussion of how fossils are formed and what they can tell us about the past. They examine fossils, and construct a model of Pangaea. Students assemble a time line depicting the development of life. 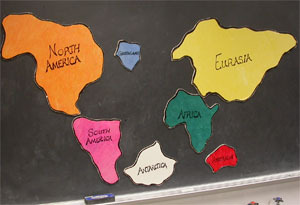 Emphasis is placed on understanding plate tectonics, geologic time and the mechanisms that create fossils. What kinds of animals can become fossilized? What do marine fossils found near Tucson tell us about Tucson’s past environment? What is continental drift and what is the evidence for it? What are plate tectonics? How was the super continent Pangaea formed? Geological Timeline – when were the major events in earth’s history? 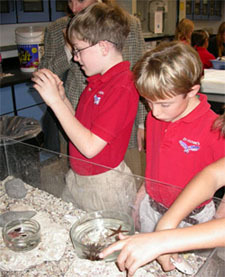 Students learn about the unique environment of the rocky intertidal zone and its special inhabitants, with an emphasis on the adaptations necessary for life in the zone between land and sea. Everything from echinoderms to chordates to some new creatures you may never have heard of are represented! What defines the intertidal zone? How do these animals eat? How do these animals protect themselves from life in the intertidal zone? (Answers: drying out, crashing waves, changes in temperature, being eaten by other animals). How are stresses imposed by man affecting the animals living in the intertidal zone? What phylum are each of these animals in? How are animals in different phyla are similar and different? Marine Discovery is a public outreach program that involves college, elementary and middle school students in an inquiry based and hands-on learning experience. 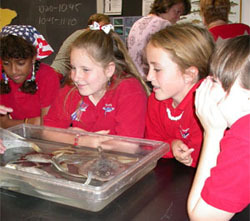 During lab station activities, students have the opportunity to work with live marine animals and teaching specimens. Students are exposed to living and preserved organisms found in the Gulf of California and gain a general understanding of the scientific relationships between them. Student knowledge and interest in ocean life is enriched, and younger students have the opportunity to interact with other, more expert learners. The Marine Discovery Program is offered through the Department of Ecology and Evolutionary Biology at the University of Arizona, with funding from the Howard Hughes Medical Institute. Undergraduate students teach third through eighth grade students about the Gulf of California and the ocean in general during a field trip to the UA campus. Visit the Marine Discovery website to see a schedule and find out about bringing your class to the Marine Discovery field trip.